Lately I’ve been educating myself on household products that are safe to use with my little family. I’m totally becoming an over protective mama, but I can hardly stand to use cleaning supplies around my home because of the harsh chemicals in them that I know are potentially harmful for me, Drew, little miss Isla and Dasher boy. A few weeks ago I was cleaning off my bathroom counter top with one of those disinfecting wipes (I won’t name the brand) and I could smell (and feel) the chemicals coming off the wipe and onto my hands and counter top. While I was cleaning, Isla started crying but before I could pick her up I had to go scrub my hands with hot soapy water for several minutes to get all the chemicals off my hands. 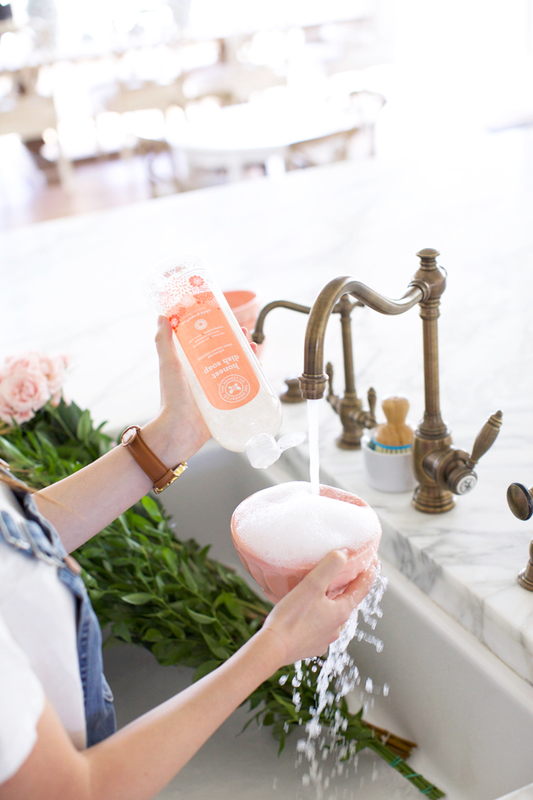 I’ve loved using The Honest Company baby products on Isla, especially because they are safe and effective so I was beyond thrilled to find out that they also offer a wide selection of household products like dish soap, laundry detergent and surface cleaner! 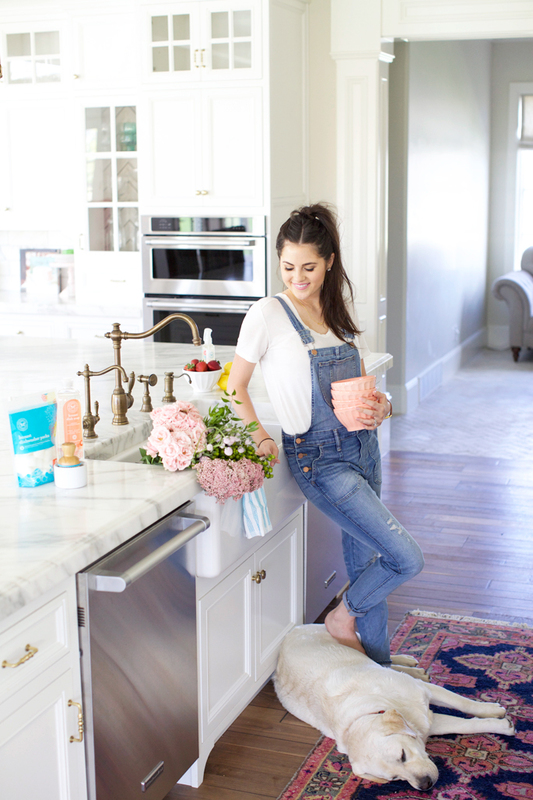 Today I’ve teamed up with Honest to share some of my favorite products I’ve been using around my home lately, with peace of mind that my family is safe from harsh chemicals! If it’s your first time purchasing from Honest.com, you can get a free full size Multi-Surface Cleaner + free shipping with an Essentials Bundle purchase!!! Use code: PPFREESHIP. See terms below. This post has been sponsored by The Honest Company who provided products and payment. All opinions are my own. It look so good and great!!!! I have actually heard some really great things about The Honest Company from my friends. I think its good for you to be so conscious about the chemicals in your house. 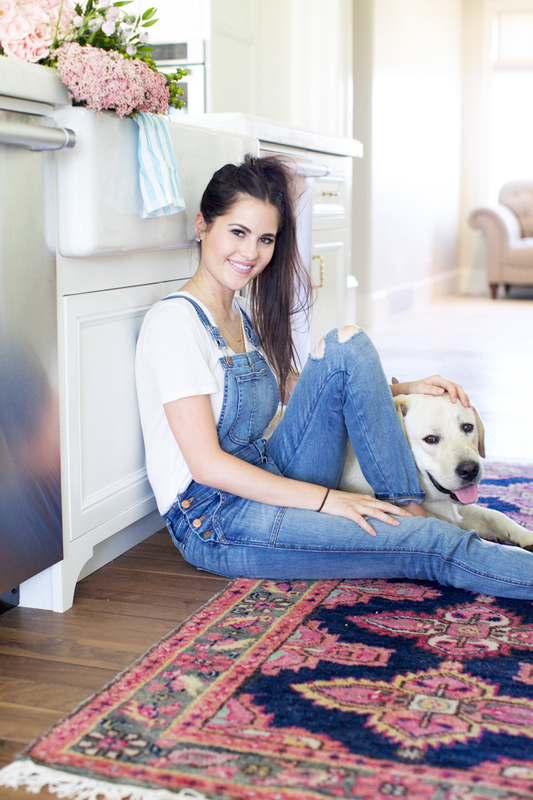 Ps–I love your overalls! I haven’t heard of the Honest Company before but the products look great. You look adorable as always. 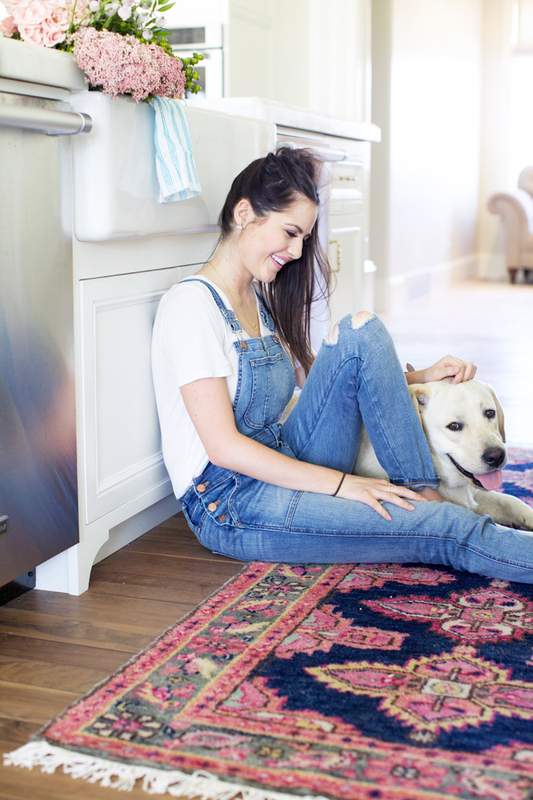 Love your denim overall! Protecting your family every step of the way! I love their packaging and their goal. Whenever you actually start thinking about the things you use/surround yourself with it becomes alarming how dangerous some of it is! I like supporting brands that want to make things safer. Such a cute photos and great post! I love Honest products and they really do great line for home. It’s actually a cool and useful piece of info. I am satisfied that you shared this useful info with us. Those overalls are so fun! We love the honest company in our house too! I wish it was more products without chemicals out there! The Honest ones seems to be great! your home looks so comfy and and perfect! Loving the overalls Rachel!! I’ve been really impressed myself with the Honest brand! I haven’t tried the Honest brand before… but embracing natural products is excellent. Humans are so adept to “fixing” everything with chemicals and medications…and sometimes (honestly, probably always, though we don’t really get it), the best healers are those closest to nature. I adore your home… all the white and neutral colors are so calming and beautiful. You’re definitely one of my inspirations for home design. I’ve wanted to try some of their products for a while. I hate using cleaning products that have a chemical smell, and then having it be on my skin. All of the products from Honest seem really nice. I have been considering purchasing the same rug! I have an all white kitchen as well, and this pushed me over the edge. What size is yours, and how is caring for it? I am concerned with cleaning it. Love this! Beautiful photos! 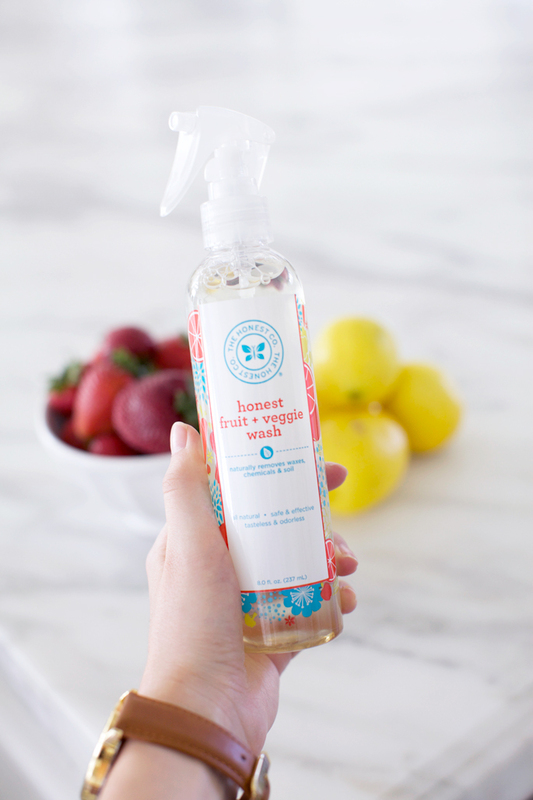 I want to try that fruit and veggie wash! I read Alba’s book, The Honest Life, and have been wanting to try the products. Your post is lovely and inspiring. Thanks! I’ve heard all about the Honest Company and how amazing they are, I really should order them. I know exactly what you mean about feeling the harsh chemicals from wipes. I’ve been hearing a lot of great things about this brand and good to know that you trust this brand. Definitely something for me to consider when cleaning the house! I’m really impressed by the Honest company! I could totally see myself using these products when I have kids one day! I’m the same way, Rach. I once was using a surface cleaner that actually made my whole hand inflamed (I have eczema) and it was then I really understood the importance of searching for and using products in my home as well as my body that are all natural and free of harsh chemicals. Glad to see you’re using them too with little miss Isla! I’ve felt the same way about the antibacterial wipes, right before I go to eat something after! I also wash my hands. 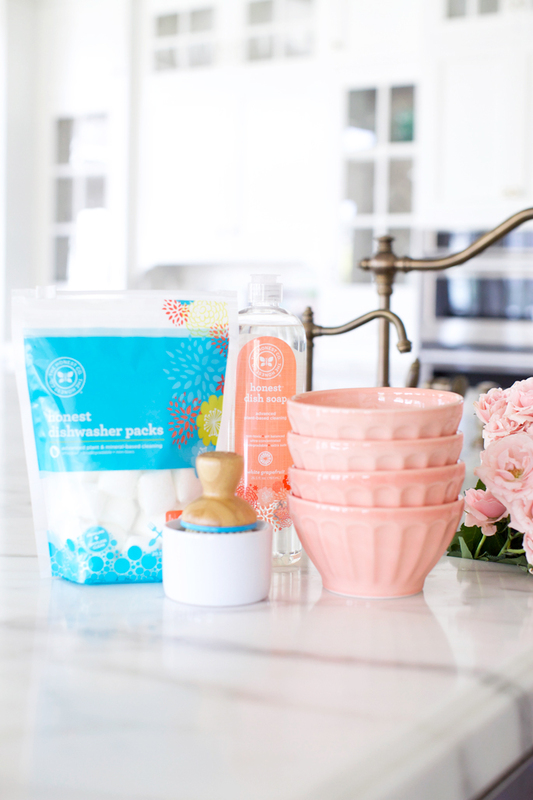 The Honest company is so great for every day necessities! Thanks for sharing some of your favorites. You looks so freakin cute! Great post Rach! I love these products! 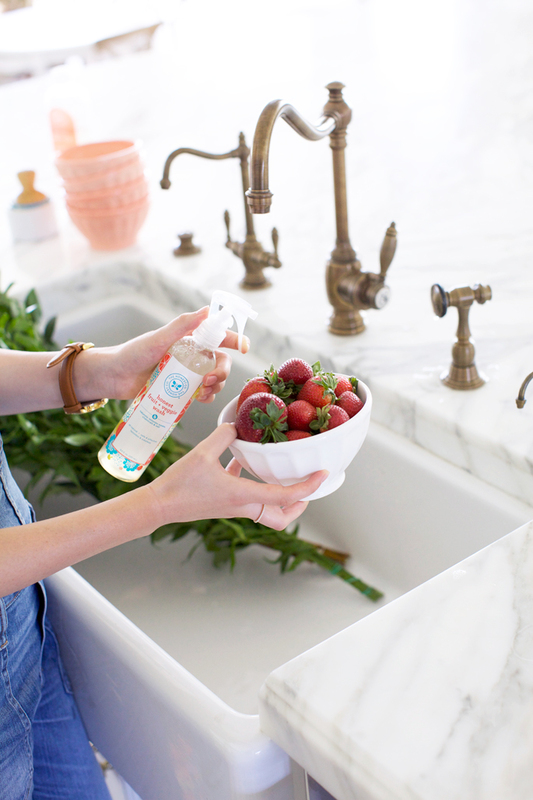 I’m on board for any cleaning item that is healthy for the whole family! I haven’t heard of this product before. You have a beautiful home and adorable dog, too. Your house is beautiful! And you even look stylish while cleaning. I have actually been looking at these products for about a week now but didn’t know anyone who used them to get a review! This is perfect! You home is gorgeous and Dash is adorable!! Rachel, I LOVE your style! 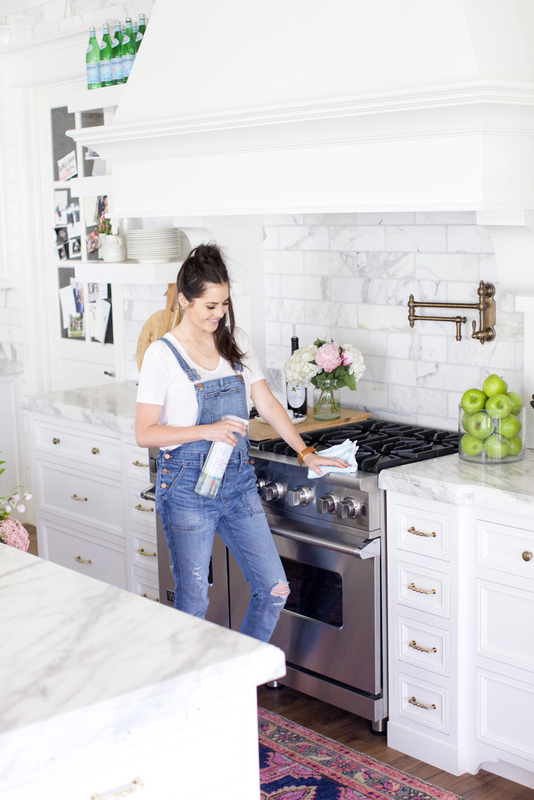 I’ve been interested in trying the HONEST Co. products, specifically the multi-surface cleaner and I was so glad to see that you are using them on your gorgeous marble kitchen countertops. I have had my polished Calcutta Gold marble kitchen countertops for almost 5 years and I LOVE them. Can you offer any advice on what you do maintenance-wise(sealing, etc.) 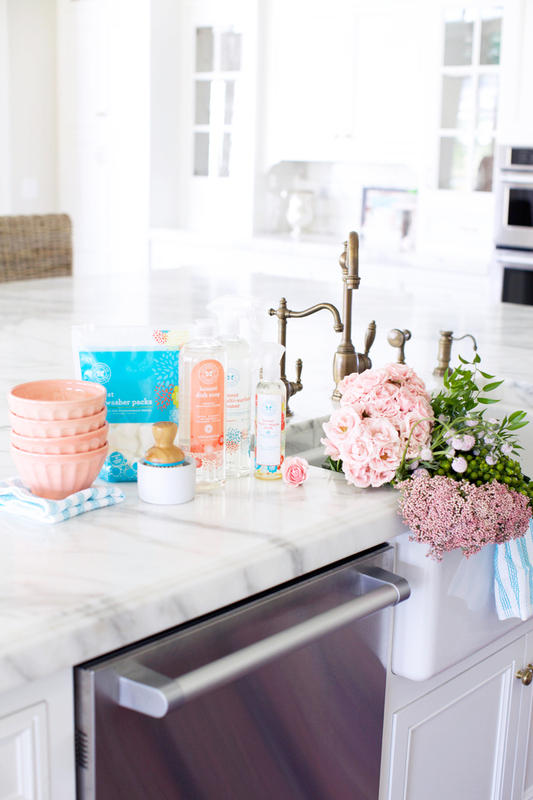 to keep your counters looking so great? We are not a messy family but we do enjoy entertaining and enjoying our acidic food and drinks (tomatoes, lemon, wine, etc.). Thanks so much and love seeing your posts. Thanks for all the great info. Your home is beautiful! Wow, I have to try that! Nice pictures. LOVE Honest products – they’re the best! BTW, I love your casual at home look. You have the most beautiful kitchen love. I love how safe these products are and I’ve always heard really good things about them. Loving those suspenders! Great look girl and good call on using the Honest Company! I like the product package! :) Plus, I heard they are really good! But do they shipp in Europe? I will have to try this product. I totally agree with you about other disinfecting wipes-Lysol products are the worst! I understand companies contact you, but it’s always concerning to me when I see that a sponsored post is one where not only products were provided for a review but that you were also given payment in cash to do so. I’m not doubting that you don’t love the products but it just doesn’t provide the same level of authenticity as a blogger in my opinion. Those overalls look so cute on you. You make me want to get a pair. Honest is truly genuine and very loyal to customers. I must try that home cleaner! You look fab even at home. :) I’m a denim lover too, I like to pair jumpers with crop tops though. Love these products will definitely need to check out! I ADORE your kitchen! And just wanted to say I love your blog too! Am a new reader so really enjoying getting to know you! Your home is absolutely gorgeous!!! I am in love with your kitchen it!! How do you feel about your countertops?Do you have issues with etching and if so is it super noticable? Would you choose them again? Sorry for all the questions but I am trying to choose our countertops and I love marble but I am terrified due to all of the horror stories i’ve read. Rachel, I love your rug! What size did you get for your kitchen? Im in love eith your Kitchen fsucet and pot filler!!!!! ? who makes it!! ?